Oklahoma City, like most capital cities within their respective state, is the largest and most bustling place in all of Oklahoma. The downtown area is a 115 city block epicenter of business and entertainment. There is plenty to explore here in the country’s 8th largest city. 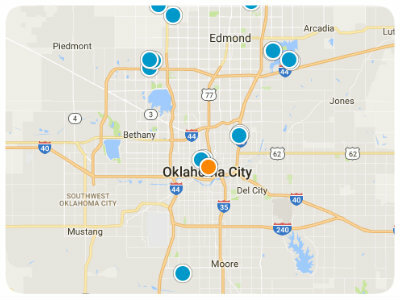 Oklahoma City, OK homes with 3 car garage are popular among OKC transplants. The area of Outabounds/Nichols Hills offers some of the most lavish and sought after property in the city. Each home is uniquely exquisite. These homes are really beautiful and worth the investment. Located roughly eight miles north of the downtown area, Nichols Hills has a clean and quaint suburban atmosphere. Situated alongside lake Hefner, Nichols Hills residents can enjoy the city’s best golfing at Lake Hefner Golf Club. This is a great place for families to grow and thrive as well. 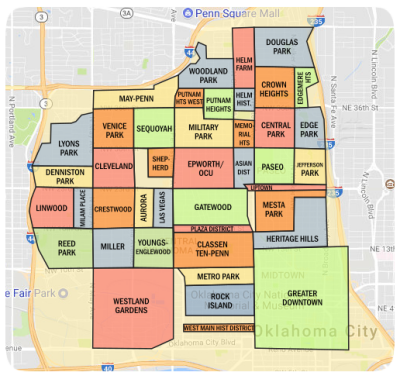 The neighborhood is within the Oklahoma City school district, offering two elementary schools, W.Nichols Hills and Nichols Hills. Just north of Lake Hefner there are some truly incredible properties. Homes that seem as if out of a dream are available for those with impeccable taste. There are some very elegant five bedroom homes with truly regal style. This area offers a number of all brick, Victorian style homes as well as Tuscan style villas. They really have it all in Oklahoma City. Many of the properties are situated on plentiful acreage. These homes have high-end features such as koi ponds, waterfalls, and beautiful hard wood floors. In this area there are many riding trails for those who ride horses. The Gaillardia Country Club is also very close by for those with an interest in socializing with the community. The area has a shopping district and other amenities. Oklahoma City, OK three or more car garage homes boast access a lot of culture within the city’s many museums and attractions. There is a museum to suit anyone's interests, including the National Cowboy and Western Heritage museum, museum of Osteology, and the American Banjo museum. For a look into history, there is the Oklahoma City National Memorial and the Overholser mansion to explore. Oklahoma city also offers the unique Myriad Botanical Gardens, an urban tropical environment open to visitors. For all of the sports fans, Oklahoma city has a wonderful baseball stadium, the AT&T Bricktown Ballpark. The Oklahoma city Redhawks, the city’s minor league baseball team, play regularly at the stadium. For the sporty, adventurous type, Oklahoma City has converted its large grain silos into an immense indoor rock climbing gym. This unique sports complex is located in downtown Oklahoma City, in the Bricktown district. Oklahoma city is also known for its steakhouses as well as many southern food restaurants. Many of the best dining experiences to be had in Oklahoma city can be found in the Uptown area, but Nichols Hills has some of the best Italian fine dining restaurants. Oklahoma City is quickly becoming one of the leaders in urban beautification. With its many parks, including the 144 acre Martin Park Nature Center, Oklahoma City offers the best of city life with plenty of nature for relaxation and fun. There are three urban reservoirs within the city limits, all available for fishing and boating. At the city’s largest body of water, Lake Draper, there is even room for residents to enjoy jet skiing and water skiing. Oklahoma city really offers the best of both worlds. Beautiful Corner Lot! This spacious home sits on a lovely corner lot in Moore school district. New flooring throughout, Storm Shelter, and much more.